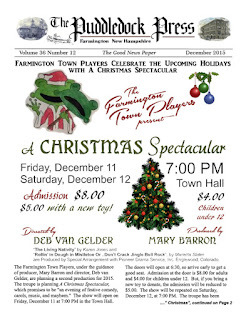 The December issue has been posted on the Farmington Historical Society's Scribd site, and is now available for viewing online. You can view and download and print the issue in color from the Scribd site, if you wish. 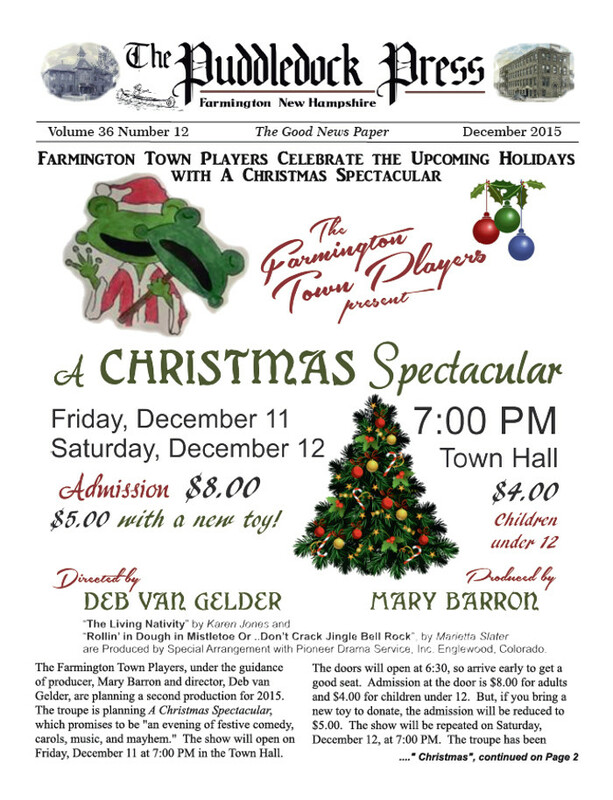 Printed hard copies of the December issue are partly distributed and will be available at all our fine distribution sites in Farmington by next weekend. To find out where to pick up your printed hard copy, check the Find a Puddledock tab on this site, and select Current Edition for the list of our fine Farmington businesses that carry the Puddledock Press! Don't forget to thank these establishments for carrying the Puddledock, visit them often, and remind them how you appreciate their supporting our paper, and that you'd love to see them advertise in the paper! Please consider placing an ad in the paper for your business or non-profit organization. You can help to support our Community newspaper and our services like the Around the Town Calendar, and online access. Consider running an ad or just sending in a contribution. Hope you enjoy the December issue! Start submitting your news and articles for January issue now. Season's Greetings for a Safe, Happy, and Cheerful Holiday Season! Thanks to all our advertiser sponsors and loyal readers! Our volunteer staff wishes you a very wonderful, safe, and loving holiday season. The May 2017 Edition of the Puddledock Press is Out.